CNet: The good: Relatively decent low-light photos; reasonable wide-angle lens; extra flash reach; built-in neutral-density filter. The bad: No video outputs; few manual controls. 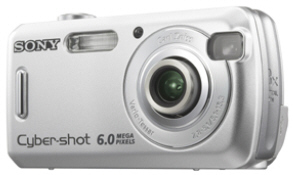 The bottom line: Solid high-ISO performance and a relatively wide-angle view are among the features that make the Sony Cyber Shot DSC-S600 a versatile budget-priced 6-megapixel camera for casual snapshooters.